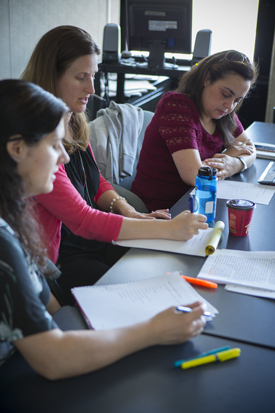 Our program is small and welcoming, providing students a collaborative environment to interact with their peers and contribute to advanced research in language and linguistics. "I chose the LAL program at York University for its selection of leading experts in sociolinguists and its multidisciplinary approach to the study of language. Looking back, it was one of the best decisions I have ever made." "I completed both my Master's (2002-2004) and PhD (2007-2013) in the Linguistics & Applied Linguistics Graduate Program and am very pleased with my experience overall. One of the unique strengths of the program is its truly encompassing definition of "sociolinguistics", which brings together faculty and students who conduct research from a wide variety of approaches including discourse analysis (e.g., critical discourse analysis; perspectives from linguistic anthropology), language variation and change, language contact (e.g., pidgins and creoles), language and gender, language and the law, language planning, and the list goes on!" "I had been out of school for quite a long time and I felt intimidated at first. I had questions about everything, and received lots of guidance and support and all my questions were answered. You couldn't get a kinder and more efficient Program Assistant than Rose. I met brilliant professors and classmates. I even had weekly chitchats with professors who hadn't taught me. I really enjoyed the LAL program."